Ellie is desperate to find someone to look after their elderly housekeeper, whose health is failing. But employing a carer found by Ellie's difficult daughter, Diana, proves to be a mixed blessing when Ellie returns from a trip to America to find that carer Claire has implemented a number of bizarre changes to the Quicke household routine. Claire is heavily involved in 'the Vision', a local church with a charismatic, powerful pastor, who- seemingly coincidentally - is looking for Ellie for financial help in his current project, housing reformed addicts. But Ellie is suspicious - and more so, when details of Claire's chequered past comes to light. Can Ellie trust Claire and Pastor Ambrose? Although this book is extremely well written, I must inform you that Ellie is exactly the type of woman I don't like: a pushover. She returns from a trip to the United States to find her household changed. And not changed slightly, either: her furniture has been moved around; her food, coffee and tea has been thrown out, Rose, her elderly housekeeper, appears to be lethargic when returning from a visit to 'the Vision' with Claire, the new carer, her cleaning people have quit and been replaced with two women who refuse to listen to her and do whatever Claire has told them to do, and she discovers that people are coming the next day to paint the interior of her house green. And what does she do? Nothing! Unlike me, who would have thrown Claire out in the street immediately, she decides to keep her until a new carer is found. She even tolerates Claire allowing Pastor Ambrose into her house to try and change her mind. Why is beyond me. I would have called the police immediately and filed a restraining order against them both. Having got that out of the way, I will continue on: when Ellie returns and finds all these disturbances, she speaks with her daughter Diana, who recommended Claire, and actually sort of shifted Claire over to her when she decided it just wouldn't work having her as a nanny. But what Diana didn't tell Ellie was that Claire was a person of interest in the disappearance of a young teenage girl. Even though Claire goes into histrionics whenever Ellie mentions sacking her, it also makes Ellie suspicious: what if there were other missing girls? Following her instincts, she asks her police officer friend Lesley to look into the matter for her. And what she finds doesn't make her happy. With her husband Thomas still in the U.S., she must deal with Claire and the ever-present Pastor Ambrose on her own. Well, almost on her own, Mikey, the young son of an ex-employee, has for the most part been Rose's guardian angel while Ellie was gone. He has done his best, but is still a thirteen-year-old boy who had to pretty much sneak in under Claire's radar. And Ellie finds out that Ambrose has applied for monies under Ellie's trust to buy the home he rents for recovering addicts and the like, even crashing a meeting she was having with the other members of the trust. (We in the United States refer to it as a halfway house). But when Lesley finds some disturbing information regarding Ellie's inquiry, it raises even more questions, and Lesley requests Ellie's help on the subject - which, Ellie being who she is, says no, waffles, and then agrees to help. What comes of it all is something even more sinister than even Ellie could imagine. Now, after telling you my views on Ellie, and still giving this book four stars, that should also tell you that it is a very good book indeed. 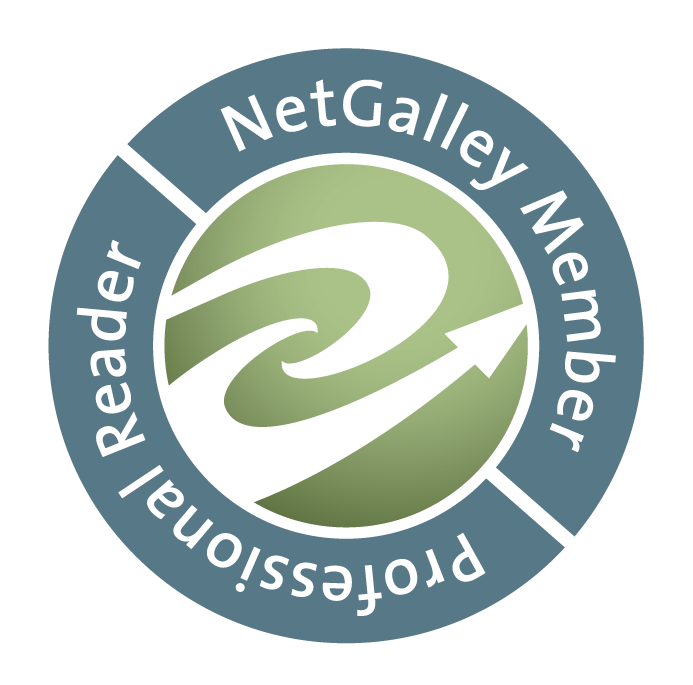 (I do not take ratings lightly, and will give no book a higher rating than it deserves). 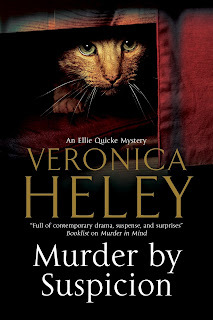 Even if you have not read any of the other Ellie Quicke books, you can start with this one, and then go back and read the others, as enough information is given that this can be read as a stand-alone. Recommended. Angie Curtis is back in Haven Harbor, Maine living with her grandmother after being in Arizona for a number of years. She has taken over the directorship of the group known as Mainely Needlepointers, who sell their work around the state. Angie's friend Sarah Byrne, one of the group and owner of a local antique shop, calls Angie because an old decaying mansion in town has been purchased by an actress, Skye West - and Patrick, Skye's son, has asked Sarah to appraise the needlepoint pictures left hanging on the walls. Sarah has asked Angie to help her. When the women realize the sheer extent of the work, and the fact that Skye basically wants a "yard sale" out of anything that can be salvaged, she offers the two women $15,000 each for a week of work. Skye learns that Angie worked for a PI in Arizona and wants to hire her. Skye believes that Jasmine didn't die from falling head first into a fountain and drowning, but was murdered. She also believes the previous owner of the house, Millie Gardener, was murdered too. So Skye has compiled a list of possible suspects and wants Angie to ask questions and see if anyone knows anything about what happened that night. But when Angie agrees and begins digging around, she doesn't realize just how close to the killer she might be. This was a nice cozy to dig into, and was written well. With Angie preparing for her Gram's wedding, and Gram's wedding shower, she now has to try and find a killer, without the killer knowing what she's doing. Plus, Sarah has decided Patrick is her personal property, and even though Angie wouldn't mind pursuing a relationship with him, she doesn't want to lose Sarah's friendship and keeps him at arms' length. We find that more than one person didn't like Jasmine, and thought they had reason to see her dead. But Angie doesn't want to believe any of them would kill her, so doesn't really follow the clues as closely as she should. It is only with the help of Sarah and Dave (another Mainely Needlepointer and high school biology teacher) that Angie is able to start putting the them together. This is the second book in the Mainely Needlepointers series, but can be read as a stand-alone. All in all, it was an enjoyable read. Recommended. There are some very good new releases that will be published soon, and I am looking forward to reading many of them, and hope that you will be also. 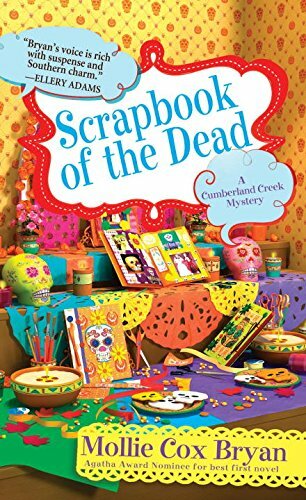 Scrapbook of the Dead, by Mollie Cox Bryan, is the newest in the Cumberland Creek mystery series, and a Halloween-themed mystery to boot. This time out, Halloween means spooky scrapbooks for the Cumberland Creek Scrapbook Crop, but what's been happening around town is truly frightening. First a dead woman is found in the freezer at Pamela's Pie Palace, and the next day a second woman is found murdered by the river. Reporter Annie Chamovitz learns the victims were sisters and is certain their deaths are linked. Most bizarre of all, both women were found clutching scrapbook pages. 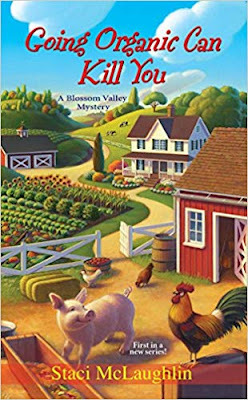 As their Saturday night crop quickly becomes an opportunity to puzzle out the murders, the ladies begin to wonder if Pamela is hiding more than her secret recipes for delicious pies--or if the crimes are related to the startling discovery that there are gangs in Cumberland Creek. As All Hallows Eve approaches, the crafty croppers must cut and paste the clues to unmask a deadly killer. Since the holiday season is fast approaching - the 'carving season' as I like to call it (first we carve pumpkins, then turkey, then ham, and finally roast beef), I am looking forward to getting a jump on the season and reading this one. 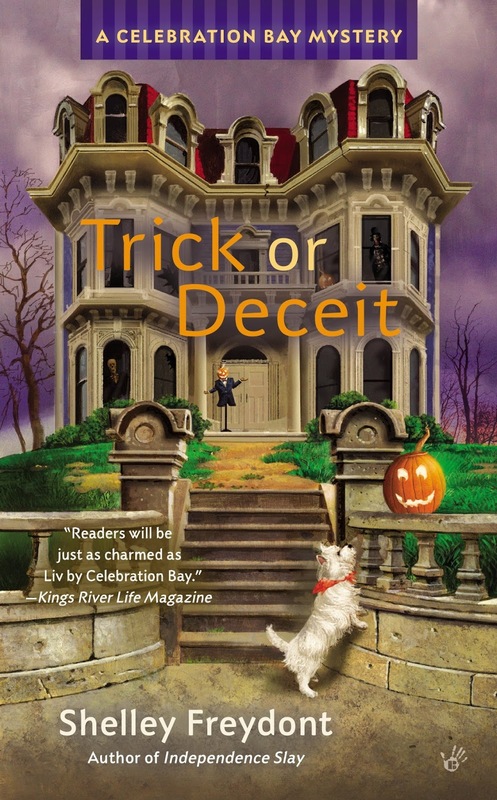 Another new cozy mystery release is Trick or Deceit by Shelley Freydont. 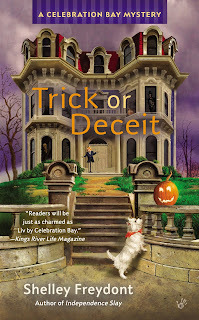 It is a Celebration Bay Mystery, and also Halloween-themed. This October in Celebration Bay, you can't swing a black cat without hitting a haunted house. There are three finalists in the contest for the town's official Haunted House, and ten thousand dollars will go to the winner, with the rest of the contributions and proceeds funding a new community center. Event coordinator Liv Montgomery has invited her friend Jonathan Preston, the debonair CEO of a philanthropic organization, hoping he will award a grant to the center. But after the Museum of Yankee Horrors wins first place, the transformed Victorian boarding house is vandalized...and among scattered mannequins of Hester Prynne, Lizzie Borden, andthe Headless Horseman, a real dead body is found-one of the contest judges. Now in addition to playing hose to Jon, Liv has to play detective and coordinate the clues to unmask a self-appointed judge, jury, and executioner. This one definitely sounds interesting, and I'm looking forward to reading it, having already pre-ordered it from Amazon. 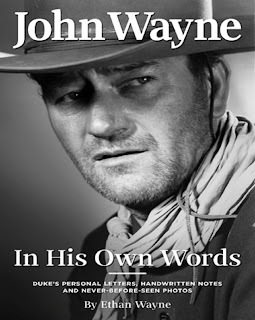 John Wayne In His Own Words gives readers an intimate look into the life of an American legend. But the letters, correspondence and chronicles that fills this 215-page book prove the Wild West's leading man was much more than another face on the silver screen. He was a loving father, a faithful friend and an unparalleled patriot. Read as Jhon Wayne consoles his kids, jokes with celebrity friends, answers his fans and advises America's presidents in this rare collection of letters straight from the John Wayne Family archives. In addition to mail to and from Duke himself, John Wayne In His Own Words boasts a forward by Ethan Wayne and exclusive photos from rare family albums. Filled with emotion, honesty and insight into the man beloved by many, this collection of artifacts doubles as a special time capsule and a must-have tribute. John Wayne is probably one of the best-known actors of our time, and a complex human being. Fiercely protective of his family and friends, highly patriotic, yet gentle and understanding, he was and will remain an American icon. While numerous books have been written regarding the Duke, this one is meant to be extra-special in that the insights are given by his own son. The screenwriter, innovative animator, highly acclaimed visionary film director, and only non-British member of Monty Python offers an intimate glimpse into his world in this fascinating memoir illustrated with hand-drawn sketches, notes, and memorabilia from his personal archive. 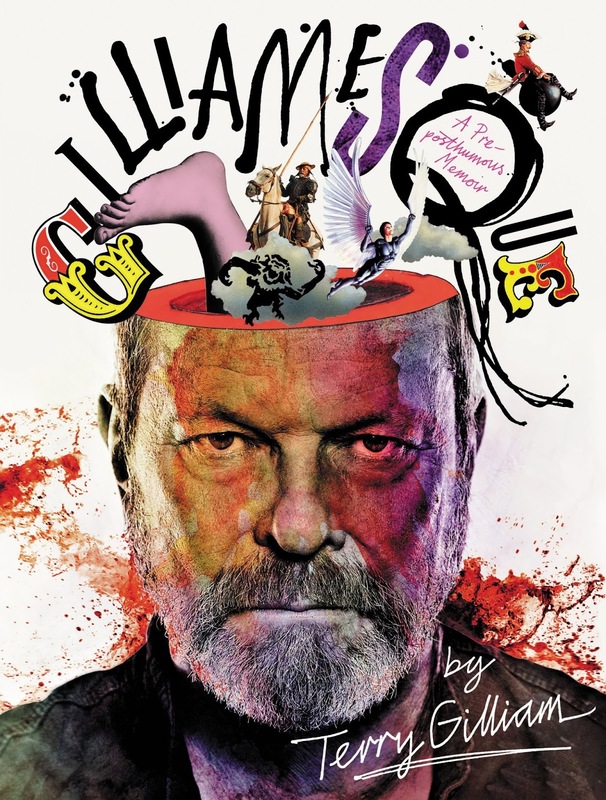 From his no-frills childhood in the icy wastes of Minnesota, to some of the hottest water Hollywood had to offer, via the cutting edge of 1960s and '70s counter-culture in New York, L.A. and London, Terry Gilliam's life has been as vivid, entertaining and unorthodox as one of his films. Telling his story for the first time, the director of Time Bandits, Brazil, The Adventures of Baron Munchausen, The Fisher King, 12 Monkeys, and Fear & Loathing in Las Vegas - not to mention co-founder of Monty Python's Flying Circus - recalls his life so far. Packed with never-before-seen artwork, photographs and commentary, Gilliamesque blends the visual and the verbal with scabrous with and fascinating insight. Gilliam's "pre-posthumous memoir" also features a cast of amazing supporting characters - George Harrison, Robin Williams, Jeff Bridges, Robert De Niro, Brad Pitt, Uma Thurman, Johnny Depp, Heath Ledger and all of the fellow Pythons - as well as cameo appearances from some of the heaviest cultural hitters of modern times, from Woody Allen to Frank Zappa, Gloria Steinem to Robert Crumb, Richard Nixon to Hunter S. Thompson. 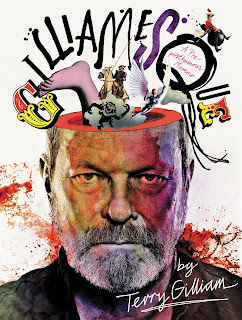 Gilliam's encounters with the great and the not-so-good are revealing, funny, and hugely entertaining. This book is an unrestrained look into a unique creative mind and an incomparable portrait of late twentieth-century popular culture. Who hasn't seen or heard of Monty Python's Flying Circus or watched one of his brilliant movies. Enough said. A treasured recipe box brought to life, now updated to include every recipe, every ingredient testing, every equipment rating from all 8 seasons of Cook's Country from America's Test Kitchen. This collection will teach you foolproof methods for making more than 300 favorite American recipes. And in addition to learning how to make great food, you can read the colorful stories behind the dishes. The recipes in this book feature the best of American home cooking with an emphasis on regional and heirloom fare. In addition to American classics like Glazed Meatloaf, Classic Roast Beef and Gravy, Smoky Potato Salad, and Apple Pie with Cheddar Crust, you'll find regional gems like Delta Hot Tamales, Baltimore Pit Beef, Charleston Shrimp Perloo, and Chocolate Blackout Cake. 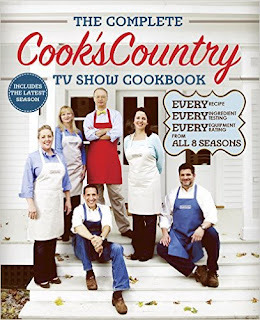 The shopper's guide, grouped together in the back of the book, includes tastings and testings from both Cook's Country and the Complete ATK TV Show Cookbook - approximately 50 pages of testing and tasting ratings and winners. For anyone who enjoys cooking (as I do) this book should be something to look forward to. Cook's Country is a trusted name, and their recipes are always delicious; a hefty tome at 576 pages. It's 1935. Rita Feuerstahl comes to the university in Krakow intent on enjoying her freedom. But life has other things in store - marriage, a love affair, a child, all in the shadows of the oncoming war. When the war arrives, Rita is armed with a secret so enormous that it could cost the Allies everything, even as it gives her the will to live. She must find a way both to keep her secret and to survive amid the chaos of Europe at war. 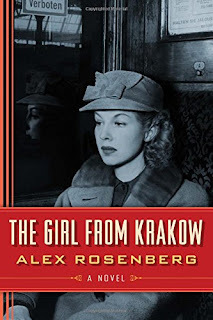 Living by her wits among the Germans as their conquests turn to defeat, she seeks a way to prevent the inevitable doom of Nazism from kaing her one of its last victims. Can her passion and resolve outlast the most powerful evil that Europe has ever seen? 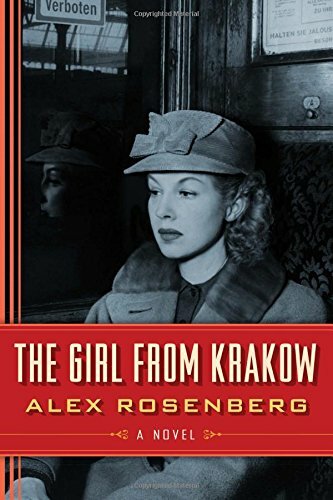 In an epic saga that spans from Paris in the '30s and Spain's Civil War to Moscow, Warsaw, and the heart of Nazi Germany, The Girl from Krakow follows one woman's battle for survival as entire nations are torn apart, never to be the same. I really don't know what to expect from this book, but it definitely sounds like a winner, and I am looking forward to reading it. Martha Rose is in her 50s, loves quilting with her best friends Lucy and Birdie, and likes her life just as it is. Unfortunately, it's about to change. One day she gets a telephone call from an attorney who tells her that her high school friend Harriet Oliver has died, and she's been made executor of Harriet's will. Completely taken by surprise, she is also saddened to learn that Harriet died alone and unloved; both her child and her husband dead before her. So alone that her body wasn't discovered for ten months. Now Martha's back is up. How could someone like Harriet not be discovered for almost a year? She was wealthy, she must have had some contact with the outside world. So Martha does the only thing she can - try and figure out why Harriet was left in her home so long, dead in a closet, but who would want her dead. And the more she digs, the more she finds; and none of it pleasant. Martha is also seeing a biker named Yossi, aka Crusher. Crusher is head over ears about Martha and wants to marry her, but she's keeping him at arms' length. Why? Because her ex-husband and ex-boyfriend both cheated on her, so she doesn't think she can trust any man. The more he tries to move in, the more she pushes him away. As executor of the estate, Martha discovers that there are missing items - all related to the Declaration of Independence. What she doesn't know is where they are. She is determined to find their whereabouts, with the help of her two friends. After hiring a couple of Crusher's cohorts to guard the estate day and night, she and Lucy and Birdie spend their days searching for the missing items. But it appears that others know of them, and someone has been in the house before her, Martha is sure of it - someone who was probably looking for the same things. The more she digs into Harriet's death - now classified as murder - the closer she's bringing herself into danger. For the most part, I enjoyed this book. The characters are three-dimensional, and the plot was very good. But there were a couple of things that bothered me. For one, she has an atrocious diet. In the real world, anyone who ate what Martha does would be diabetic and have really bad skin. Eating that much fat and sugar is only asking for a heart attack or worse. We also never find out what her source of income is. Yes, she's paid a stipend as executor of Harriet's estate, but she doesn't have a job, yet has a house and seems to be fine financially. 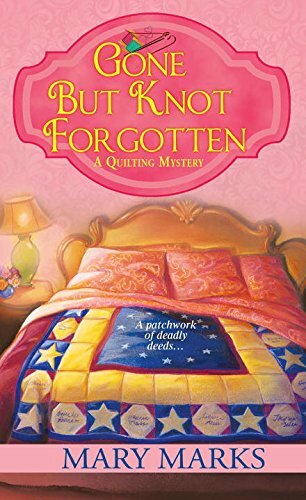 For those who haven't read the previous books in the series, Forget Me Knot and Knot in My Backyard, it would be nice to know (minor detail, but I'm big on details). But the biggest negative was her reaction to another character, after finding out something about them that she viewed as lying. I didn't see it as lying; it was something that needed to be done and they didn't have any choice in, but she wouldn't forgive it, which, by the end of the book made her appear inflexible and hard. She just wasn't willing to accept that it was necessary, and made it All About Her. Her reaction seemed almost irrational and was a letdown for me. I wasn't happy with the outcome of the situation, and all of it seeming to be her fault. Still, I felt the book was written well and I enjoyed it. Recommended. After her romantic idyll with the debonair Detective Chief Inspector Christopher Pearse culminates in a marriage proposal, Pru Parke sets about arranging their nuptials while diving into a short-term gig at the Royal Botanic Garden Edinburgh. At hand is the authentication of a journal purportedly penned by eighteenth-century botanist and explorer Archibald Menzies. 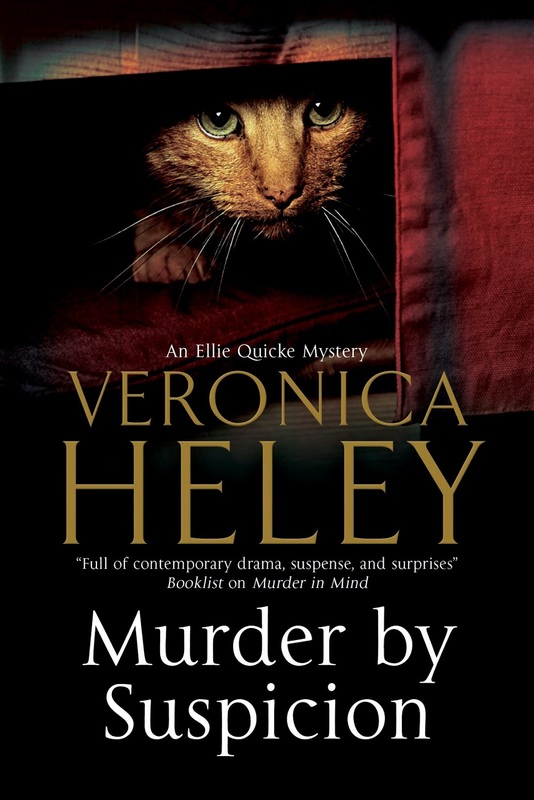 Compared to the chaos of wedding planning, studying the journal is an agreeable task...that is, until a search for a missing cat leads to the discovery of a dead body: One of Pru's colleagues has been conked on the head with a rock and dumped from a bridge into the water of Leith. Pru can't help wondering if the murder has something to do with the Menzies diary. Is the killer covering up a forgery? Among the police's many suspects are a fallen aristocrat turned furniture maker, Pru's overly solicitous assistant, even Pru herself. Now, in the midst of sheer torture by the likes of flamboyant wedding dress designers and eccentric church organists, Pru must also uncover the work of a sly murderer-unless this bride wants to walk down the aisle in handcuffs. Pru Parke has just finished her latest undertaking restoring a garden to glory and is searching for a new task. At last she finds one she knows she wants: discovering if a journal by the eighteenth-century botanist Archibald Menzies is real or a forgery. But before she can start, her paramour Detective Chief Inspector Christopher Pearse pops the all-important question and asks her to marry him. It is decided that they will marry the moment her job ends, which is three months from now. So Pru must set herself to work and attempt to plan a wedding at the same time. Luckily, her friend Jo is insisting on helping her - providing her wedding gown and the minister to marry her; but Pru and Christopher will have to locate the venue, which shouldn't be too hard a task - her job is in Scotland, and it happens that so is the minister, Jo's estranged husband Alan. But not so luckily, Pru has a nemesis at the Royal Botanic Garden in Edinburgh - and he has been found murdered shortly after having an argument with Pru, one of many they have had regarding her position and the journal. When she is called in for questioning she strikes up a sort-of friendship with one of the officers, Tamsin Duncan, who is also getting married in a few months. Soon Pru discovers that her position may not have been offered because of her work recently done, but for another reason entirely different, and she vows to find out the truth and why. As if this isn't enough, an ex-boyfriend from the States arrives and she finds out he will also be working at the RBG, although not along side her, which is a relief. 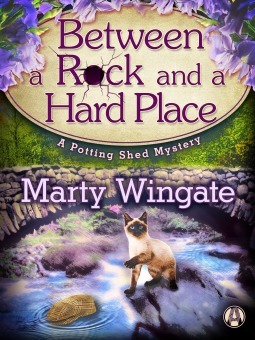 I really enjoyed this latest entry into the Potting Shed mysteries. As always, Ms. Wingate's mysteries are delightful to read. Yes, I pretty much figured out the killer early on in the book. But it really doesn't matter - the journey to the end when Pru figures it out is all that's important. And some of the side trips along the way are worth it. 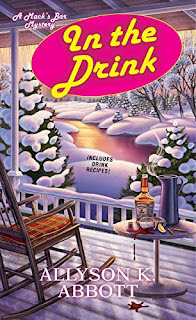 We get to meet Alistair Campbell, who hired Pru but spends his days attempting to avoid her and her questions; the mysterious Murdo, who is a jack-of-all-trades around the garden and writes notes in a little black book; Mrs. Murchie, Pru's neighbor who has secrets of her own; Tamsin, of course, and others who have their own interesting stories to tell. I like the fact that Pru is an intelligent woman, not blundering into places she shouldn't be and taking unnecessary chances. I also like the fact that she's not twenty-something but has come to England from Texas, found a new love and decided to stay and make it her home. So in the end like Pru herself, I found the destination to be just as satisfying as the journey itself. Highly recommended. Jill Gardner - owner of Coffee, Books, and More - has somehow been talked into sponsoring a 5k race along the beautiful California coast. The race is a fundraiser for the local preservation society - but not everyone is feeling so charitable. The day of the race, everyone hits the ground running...until a local business owner stumbles over a very stationary body. The deceased is the vicious wife of the husband-and-wife team hired to promote the event - and the husband turns to Jill for help in clearing his name. But did he do it? Jill is a co-sponsor of the Mission Walk to raise funds for the local preservation society. When Michael and Sandra Ashford show up at her store, she takes an instant dislike for the woman. So later on, when Sandra is discovered dead on the trail, it is not only discovered that she was murdered, but that she was deliberately placed there so someone would find her. Then Jill hears a rumor that Lille, her erstwhile nemesis and owner of Diamond Lille's, is wanting to expand her restaurant and plans to use the train shop next door. But when she talks to Harrold, the owner, she finds he isn't planning on selling. 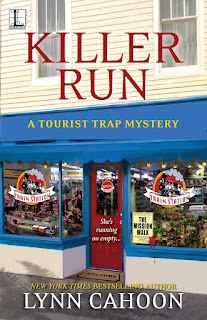 When his shop is vandalized several times, he asks Jill to help find the culprits, since the police have put his vandalism as secondary to the murder and he thinks the person will never be discovered. 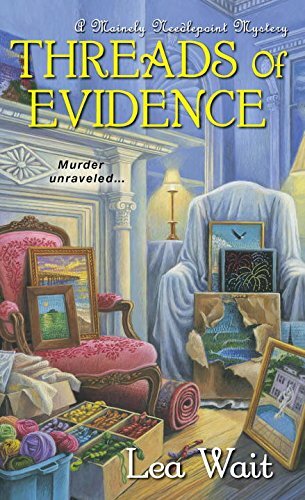 And the vacation cruise she was planning on taking with her detective boyfriend Greg King is canceled because of the murder, so Jill decides to take the time off anyway and renovate the house she was left by Miss Emily. Yes, Jill has a full plate, which isn't unusual to anyone who's been following this series. And if you haven't I suggest you do. From the first book, Guidebook to Murder, to the latest installment, we have gotten to know Jill and her friends and family. They are not as eccentric as some of those in other cozy mysteries; indeed, these are real people with real problems, which makes this series one of the best out there. While Jill and Jackie are trying surreptitiously to find out more about Sandra and who would want her dead, she discovers more mysteries: namely, why is her travel agent Rachel spending time with the grieving widower? Who is the mysterious man who accosted her one day at Lille's restaurant and asked her about the book she was reading, what was good on the menu and now seems to be everywhere she is? Who are the other two people who are trying to buy the same food truck that she is interested in? Plus, Jill is also discovering that her relationship with Greg might actually be going somewhere, but she's not at the point yet where she's willing to discuss exactly where the "where" might be. While we feel her indecision regarding their relationship, I want to push her from behind and tell her to go for it (just my opinion). When the ending finally comes, and we find out the truth about Sandra's death and why, it was completely believable. The ends were woven nicely, and all the pieces fell into place, even Jill's receiving help when in a tight situation came within the range of possibility. Ms. Gardner writes in such a pleasing manner, and creates such endearing (and some not so endearing) characters that I want to visit South Cover myself and meet these people. Highly recommended. Mackenzie Dalton has synesthesia - she doesn't feel something without smelling it, hear something without tasting it, etc. And because she helped the police (even though they weren't happy about it) solve murders using her gift, she's gone into self-imposed hiding. She's also received letters which can be construed as fan letters, and those from what she considers kooks. But one...this last one appears to be someone playing a game with her. He, or she, tells her if she doesn't figure out something unusual about the letter within a specified period of time, someone close to her will die. And she must do it alone, without the help of authorities, because, as the letter states, 'I am watching you,' So she figures out a way to involve her maybe-boyfriend, police detective Duncan Albright, even though there is a first body discovered that lets her know this person means business. She also enlists the help of a couple of her friends from The Capone Club, a group of people who like solving crimes. But one of the members of the club, Tiny, asks Mack to help him find out who killed his sister twelve years ago. There are a list of four possible suspects, and he wants Mack's help to find out who really did it. The police have closed the case as a cold file, but Tiny knows the answer is within the pages of the the evidence they collected. So Mack sets out on her tasks of staying ahead of the person who is baiting her, and also trying to help Tiny find out the truth regarding his sister's murder. 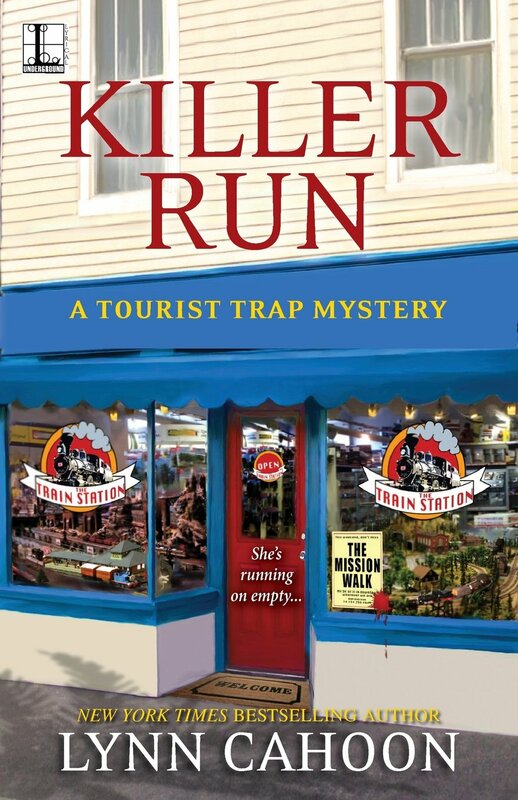 This book, the third in the series, started out well, giving us a mystery we could follow along with Mack as she tries to figure out who the killer is. Along the way we are given a second mystery to solve, that of Tiny's trying to find out his sister's killer. And all through the book I did my best to see if there were any clues as to who the killer was. It was interesting to see Mack use her gift to try and figure out the answers to the puzzles before the time limit was up, while stretching herself to help a friend. But here is where my problem lies and why I only gave it three stars: I feel cheated. To put it bluntly, we do not find out who the killer is. As anyone who has read the other reviews by now knows, the book ends...just like that. Now that might seem like an okay thing; it is, if it's a television series and you're going to find out what happens the next week, or even a couple of months from now when the new TV season begins. It is not so good of a thing if you have to wait a year or more to find out the answer. Obviously, I would have enjoyed resolution to the book, and finding out "whodunit." For me, this would have made the book so much more enjoyable. However, the writing was well done and the rest of the book was an easy read.